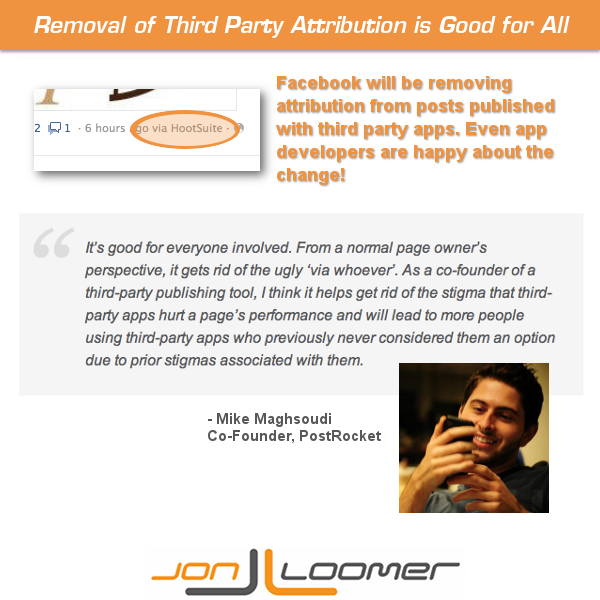 Both AllFacebook.com and InsideFacebook.com have reported that Facebook will be removing attribution from posts published with third party apps. Since you can schedule posts on Facebook, that’s not necessarily fair. A person could schedule the same post from HootSuite and Facebook and not be present in either case. But that would not be clear when viewing the one published through Facebook. So now the focus is where it should be: On the quality of the content. If you use third party tools the way they’re meant to be used, you will get the same engagement others would when publishing from Facebook. That provides a bit more freedom of mobility. For users, the attribution was completely unnecessary and distracting. It added no value to the piece of content. As mentioned above, it added only negative value. It undoubtedly made users skeptical of the publisher’s commitment. This change should make content more inviting for engagement, even if slightly. One of my first thoughts was that this may negatively impact third party app developers. When I publish with PostRocket, for example, a link appears that the post was published “via PostRocket.” Unlike HootSuite, this is a young company still trying to gain traction. So that branding could be valuable. Now when PostRocket users publish with the app, it will be in “stealth mode.” A company like PostRocket would presumably need to find new ways of promoting their brand. So I asked Mike Maghsoudi, co-founder of PostRocket, what he thought of the change. It’s good for everyone involved. From a normal page owner’s perspective, it gets rid of the ugly ‘via whoever’. As a co-founder of a third-party publishing tool, I think it helps get rid of the stigma that third-party apps hurt a page’s performance and will lead to more people using third-party apps who previously never considered them an option due to prior stigmas associated with them. Somewhat surprising, I thought. But Mike makes good points. A second issue, I assumed, was that this could remove a potential revenue stream. Many apps offer custom branding as a premium feature. For example, I use AgoraPulse to schedule my new blog posts each morning. When those posts are published, they say that they were published “via JonLoomer.com” instead of “via AgoraPulse.” This also provides a nice link back to my site. While I didn’t necessarily want that attribution, it was a nice tradeoff. I asked Emeric Ernoult, the CEO and co-founder of AgoraPulse, what he thought about this change. Like Mike, he actually supports it. 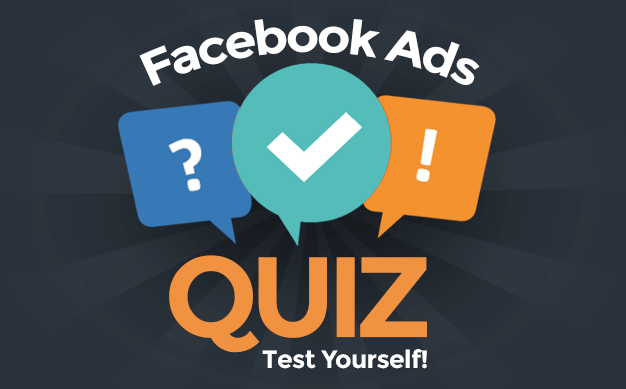 After the assertion made by some bloggers earlier this year that third party apps would damage your reach or engagement, most Facebook Page owners were still worried about the use of such apps to publish on their Facebook page. Even if it was later demonstrated that this had no effect on the reach or engagement on the concerned posts. So for app vendors (and there are many out there, not just us! ), it was a hard sell to convince page owners to publish on their page through our applications. Now that Facebook is removing that mention, posts published by third party apps or directly on Facebook will look the same. As there will be no visible difference between the two types of posts, my bet is that page owners will be less worried about publishing via third party apps. This is an excellent point. There was a time when content published with third party apps was punished by Facebook EdgeRank, but that is no longer the case. However, because of that long held notion, the mere presence of attribution could be an obstacle for brands. In the end, the removal of attribution makes life a bit easier for third party app developers, not harder. There will no longer be branding to alert users that you are publishing to Facebook with a third party app, but that’s no reason to get lazy. Those who continue to use Twitter hashtags and @ signs will give themselves away and likely won’t see any added benefit to the removal of attribution. 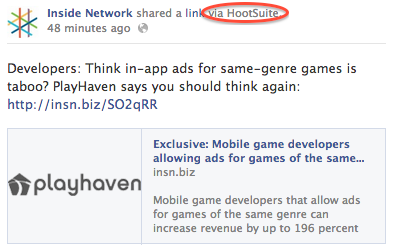 This is why performance of content published with third party apps will always lag behind that published on Facebook. It has nothing to do with the app itself, but the quality of content. And those most likely to be lazy — RSS feeders and publishing across multiple platforms, for example — will never achieve optimal results. What do you think? Are you happy with this change?